There are probably three reasons why you are reading this article: 1) to find the secret to landing a dream job, 2) to be reassured that you will be more than a paid Pennlink website-refresher for future M&Ts, or 3) to provide you with yet another way to talk about On-Campus Recruiting (OCR) without sounding obsessed. If you are here for any of those three reasons, you will find this article lacking. 2) OCR is not a race to see who can find the best investment banking or consulting job. 3) Pennlink isn’t the be-all-end-all of OCR. It is just the first step. Fundamentally, OCR is a process by which companies identify employees who will fit into their company culture and add value to the organization. This value can be generated in multiple ways: 1) through the work we do, 2) through the ideas we generate, and 3) through the people we know. There is no formula to determine your value. The process truly is subjective and that is where the recruiters come in. This brings me to my first point. In your enthusiasm to demonstrate what a wonderful employee you would be and your quest to stand out from the crowd, don’t forget that the recruiters have to go through tens and hundreds of other zealous individuals like you. This is going to sound clichéd, but honestly, put yourself in their shoes. Treat the recruiters as humans and have a conversation. Do not go into a session thinking “I need to network with so and so to achieve such and such internship.” Change your mindset to “I want to genuinely learn more and get a feel for the kind of people I might be working with.” The questions you ask and the kind of discussion you have with the latter perspective are much more likely to get you noticed and provide you with insight to the questions you truly want answered. Learning about the job and people to determine if the position is a fit for you is as crucial as convincing the company that you are the ideal candidate. This means taking the time to do a bit of introspection to see where your passions/interests lie and not blindly following the well-traveled paths of investment banking and consulting. There’s a world outside those two fields that is relatively unexplored. Pull a Robert Frost and take the path less traveled. Yes, this may require you to venture outside the realm of Pennlink and consider cold-calling/emailing potential employers. Having the confidence to “smile and dial” opens more doors than Pennlink alone and grants you access to unique opportunities. Utilizing methods outside of Pennlink is an extremely important point. If you don’t have a LinkedIn profile, make one. If you can’t muster the courage to write to someone you don’t know, practice. If you don’t know how to identify job opportunities, ask someone. Develop your own value proposition and learn to pitch yourself. Think about this logically, if every student attempts to find a job only through Pennlink the probability of any one student finding a job decreases even if he/she drops his/her resume at every Pennlink application. If you are truly passionate about a field, industry, or company demonstrate your passion by taking the initiative to pursue your goals. As a final note, stop stressing. OCR can teach you a lot about yourself and you are in a great place to access any opportunity you want to pursue. I know this is easier said than done, but realize that rejections aren’t personal and that each company sources talent based on current needs. On the flip side, take each interview granted as your chance to shine and prepare as such. But most of all enjoy your semester; recruitment is a recurring part of any career but M&T and college will only happen once. Nonie is a current M&T senior in the Class of 2013. 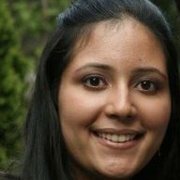 She studies Computer Science within Penn Engineering and concentrates in Finance, and Management – Strategic Management in the Wharton School. After graduation she will be heading to Seattle to work for Microsoft full-time.